Great article. My son is just starting to pitch and I am seriously considering having him wear a helmet. I have been looking for the face mask for his batting helmet which has not been easy to find. My son got hit in the face with a fastball when he was 10, but I never really worried about a face guard for hitting. I was more worried about a helmet for pitching. Buy the pitching helmet for your son by clicking on the link in the post. If McCarthy was wearing a helmet he would be pitching in next game in the rotation. I agree compeletely with your position on this. However, I must caution that the helmet you recommend (and similar products, which are catchers' skull caps) are NOT engineered for protection as are batting helmets, which have dramatically more padding, and thus they will not offer nearly that degree of protection. Batting helmets have extensive padding and they are tested for protection from thrown balls. Catchers' skullcaps do not have this padding, and batted balls travel even faster than pitches (one of Giancarlo Stanton's homers was over 120MPH off the bat). Skullcaps also do not have earflaps. I think it is unsupportable to say that if McCarthy was wearing one of these helmets he wouldn't have missed a start. David Wright was hit in the helmet -- the padded batting helmet -- by a pitch and sustained a concussion that sidelined him for weeks. I'm not saying a skullcap wouldn't afford some protection, but I think you are dramatically overstating the case. Easton briefly offered a pitcher's helmet that was designed for the job, but it seems to have been discontinued. We need some purpose-built headgear for pitchers. Make-do solutions are not going to get it done. Until then the catchers skull cap will be better than nothing. We just required skull caps for our pitchers in our live-pitch little league divisions. I would agree that some protection is better than nothing, but clearly there needs to be a helmet that is actually designed to protect pitchers. Some type of drop down ear cover would significantly increase protection. Why not just have them wear their batting helmet when they pitch? Are they so heavy and cumbersome that they'll affect their pitching? 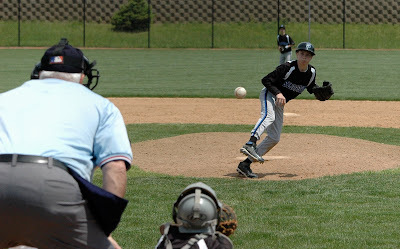 My son, who turns 9 in July will soon be pitching in a league of 9-10 year olds. Also, do kids that age hit it hard enough to require chest protection shirts? Thanks! Batting helmets do not offer enough visibility for fielding and they are too heavy. Plus I think that a pitcher wearing a batting helmet will get ridiculed. The catchers helmets look like ball caps. They create some discussion, but mostly out of curiosity. Yes 9 and 10 year olds can hit hard. Our entire team U9 - U10 team wore chest protection shirts. My son had two rebuilt ear drums and these were bad surgeries for my son. Talking to his doctor, the suggestion of wearing protection during pitching to protect his ears was made. My son wore his batting helmet with full facemask pitching in U8 last year. He was one of the top pitchers in the league so it did not adversely affect his pitching. From day one, we told both his coaches and my son if he pitches he has to wear his helmet. Not one word was said from his teammates, coaches, parents, or any opposing teams. My wife and I have stated that he will be wearing a helmet throughout his career (or until he doesn't have to listen to us). We figure if he's used to it from the start through his entire career, it will never bother him. I have heard of two pitchers in our local area being hit in the face by pitches so I'm glad he is protected. This year there is stealing on passed balls and next year full stealing. I am constantly looking for solutions to open up his vision more. This bat is an excellent choice for all youth baseball players and especially for those big hitters looking for a longer bat and an enhanced sweet spot.